The traditional lands of the Otoe-Missouria people were desirable farming lands to the settlers from the east. As more and more settlers came onto Otoe-Missouria land, the tribal people fought to protect it. 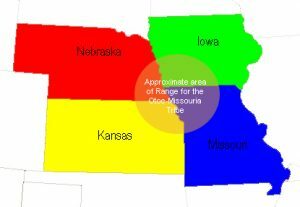 Although a small tribe, the Otoe-Missourias bravely fought any who attacked them including the white settlers who had essentially squatted on the tribe’s land. In 1855 the Otoe-Missouria people were confined by the United States government to a reservation on the Big Blue River in southeast Nebraska. On the reservation, from 1833 to 1841, Otoe-Missouria pupils learned rudimentary reading and writing, but the principal instruction was in Christianity. Unsatisfied with the education they were receiving, the Otoe-Missouria destroyed the mission school. They then deserted the new village of Yutan for refuge deeper in the Platte Valley. Life on the Big Blue Reservation was hard. The tribe was not allowed to hunt for buffalo. The government encouraged a shift from a migratory lifestyle to an agrarian one without consideration of long established tradition or social structure. For years the tribe watched as acre by acre of their land was sold off by the government to non-Indians. They suffered as treaties were broken and food, medicine, livestock and basic essentials were not delivered as promised. Sickness was rampant, children starved and the mortality rate climbed higher year after year. In 1881 they were moved to Red Rock, Oklahoma, where the tribe is currently located. 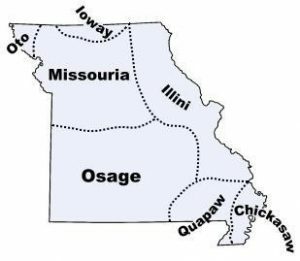 Otoe-Missouria land was again taken from the tribe in 1887 when the U.S. government passed the Dawes Act. This broke up the Otoe-Missouria reservation and opened land deemed as “surplus” to settlement by non-Indians and development by railroads. It was not long before one-half of the allotted lands were lost from Indian possession.